Teardrop Trailers: Why Are They the Most Likely Alternative to Tent Camping? Teardrop trailers get their name from their unique “teardrop” contour, which comprises of a large curved front that tapers towards the back of the trailer. Their origin dates as far back as the 1930s, during the Great Depression, when people migrated a lot in search of jobs. They were mostly custom-built at home to offer low-cost shelter while travelling. Publications such as Popular Home Craft, Mechanix Illustrated, Popular Science and Popular Mechanics, were a great resource for DIY teardrop trailer projects. The “Trailer for Two” article, published in a September issue of Mechanix Illustrated in 1947, was perhaps the biggest breakthrough towards furthering the popularity of teardrop trailers. 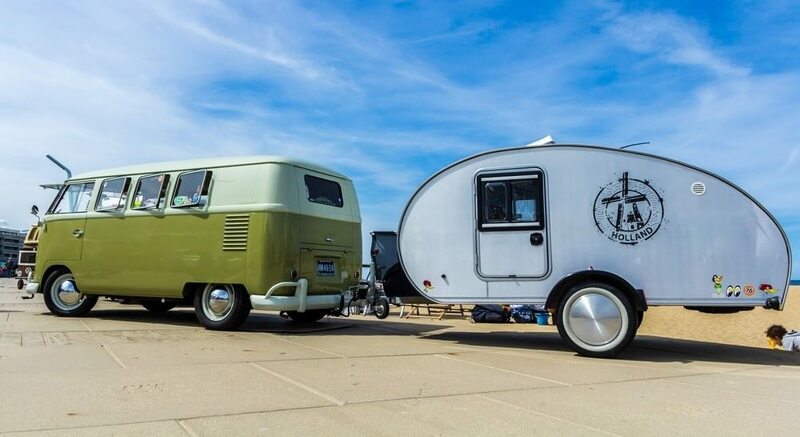 The design styles of teardrop trailers and those of Airstream travel trailers are highly celebrated and replicated in the RVing industry up to date. Teardrop trailers are streamlined, lightweight and compact in size with lengths of 5-14 ft. and heights starting from 4 ft. upwards. They also have narrower widths, about 5-7 ft., resulting in a slight protrusion of the trailer’s wheels (usually covered by fenders). Teardrop trailers weigh as light as 1000 lbs. or less, making them towable by almost any vehicle without much influence on fuel costs. They can sleep in up to two people in the sleeping cabin and probably more with roof tents or other extensions. The most basic floor plan for these towable RV comprises of an enclosed galley kitchen at the back and a sleeping/cargo space at the front of the trailer. Teardrop trailers were an invention of necessity, back in the 1930s, for provision of affordable shelter and relocation in search of greener pastures. It was common to see small custom-built trailers like the single-wheel trailers, back in 1937, which was built for sportsmen or individuals looking to easily tow and transport moderate loads. They provided an ingenious solution to counter the high living costs and unemployment effects. Teardrop trailers are nowadays designed to be more comfy than ever before without compromising on what they are synonymous for: versatility, affordability and unparalleled camping experience. With regards to the towing vehicle, do consider its towing capacity, the Gross Vehicle Weight Rating (GVWR) or Gross Trailer Weight (GTW) of the trailer and required type of hitch. Usually, a Class I or II hitching system will be enough to tow a teardrop trailer. A Class I hitch supports a GTW of up to 2,000 pounds with a maximum Tongue Weight (TW) of 200 pounds while the Class II hitch will carry a total GTW of up to 3,500 pounds with a TW of 300 pounds. Make sure you have an appropriately sized towing receiver in addition to wheel chocks and leveling jacks for easy towing. Most teardrops have a galley kitchen at the back with all the necessary cookware and outdoor cooking needs. Typically, a sink, cooktop and overhead storage compartments for your cutlery, dry foods and pans are a part of these trailers’ kitchen components. You can also expect basics like propane tanks, freshwater holding tanks, laminate countertops and a sprayer hose for easy cleaning. 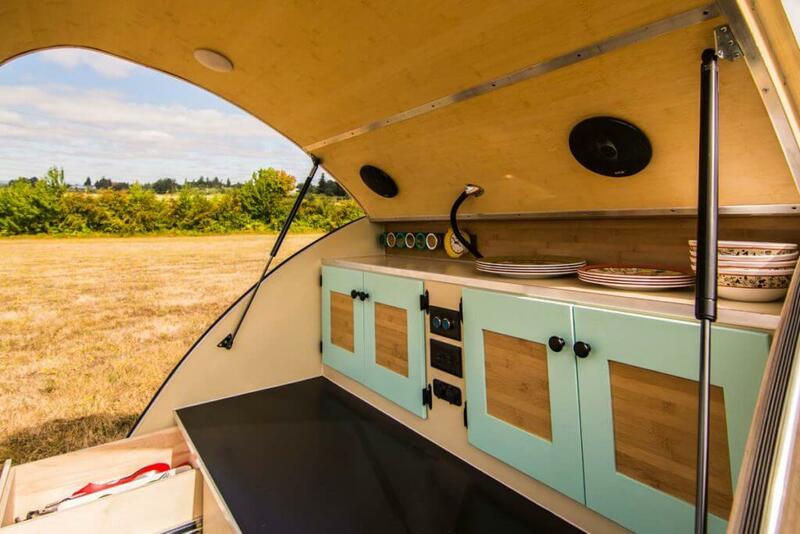 The Kitchen Compartment of Aero Teardrop. Aero Teardrops is a popular teardrops manufacturer. A canopy with folding chairs can offer a good outdoor living and dining space, but do make sure to have a shade or rain cover available to help deal with rain and other elements. Otherwise, a picnic table as present in most campsites will suffice. The sleeping cabin is located at the front of the trailer and can be used as cargo space when on the road or as a dining/living area. It can fit in a queen size bed complete with underneath storage. Some teardrops will have folding sofas for a more convenient dining and sleeping conversions. Some models may also include bunk beds for the kids’ sleeping space. These types of trailers will mostly use a tubular steel frame foundation and can be made of aluminum, steel or fiberglass material. A wood backing may also be included on the sidewalls for insulation and interior décor purposes. An aluminum body with a hardened roof allows for maximum longevity and adequate support for roof tent installations. A molded fiberglass unibody construction ensures durability and protection from the elements. Powder-coated steel too can be found on more premium teardrop trailers. A rubber roofing (TPO or EPDM) is very common in trailers and generally reliable. However, a seamless body construction should be your first priority. Most of the flooring and cabinetry in teardrop trailers is done using plywood (birch or walnut), which is then coated with a clear lacquer or marine epoxy to prevent water damage. Be sure to check if the trailer is properly insulated by checking on the indicated R values on the rig. Carrying out thorough checks on the rig for any signs of structural, cosmetic or water damage is also highly recommended. Lighting. LED lighting is usually very power-efficient. Dome lights and a skylight are an addition for ambient lighting. Windows. Tempered glass dual-screened windows for longer lifespans and keeping bugs offs, window shades/curtains for privacy and blocking light and large windshields for panoramic views of the great outdoors. Power supply and electrical. Deep-cycle batteries, inverter, DC/AC outlets, solar panel kit, USB charging port. Ventilation. Vent fan and built-in air conditioning unit. Storage. Floor storage, wood cabinetry and bedframe storage. Kitchen/Dining. Pass-through and wide gallery counters for faster food servicing and setting up of the dining area, stainless-steel cooktops and a mini-fridge/cooler. Other additional features. Included awning, wet-bath with a toilet, shower and sink, TV and entertainment center, many exterior color and design options, electric brakes, double entry doors for easy access to the trailer and other accessories such as side-mount screen room tents, covers and tailgate tents to counter rainy conditions and other elements as well as a lockable tongue storage box for additional space. Lastly, for improved towing experience, ground clearance and handling, a trailer with a torsion axle is the most preferred over the ones with leaf spring axles. A torsion axle is mounted directly to the frame of the trailer for maximum rigidity and support. The more popularly-used leaf spring axles consist of curved stacked springs and are mounted over or under the trailer’s axle. Torsion axles outperform their leaf spring counterparts by offering a less noisy and smoother ride, improving on handling on rough roads, requiring little to no maintenance and usually having no metal to metal contact. However, do keep in mind that torsion axles will increase the cost of the trailer and are very expensive to replace. With weights as low as 850 lbs. and lengths of 4 feet to 14 feet, teardrop trailers are the most lightweight and easily towable trailers in the market. They can be towed by many vehicles including cars, family sedans, Mini Coopers and even motorbikes on some models. This feature translates to greater fuel economy plus an easy and enjoyable towing experience. Teardrops are very low to the ground while still maintaining adequate ground clearance perfect for accessing back trails and other remote areas. Risks of swaying and jackknifing in this type of trailers are lower as compared to travel trailers and pop-up trailers. Backing up and uphill driving will also be less challenging in a teardrop trailer than in other RV types. Some Homeowners Associations (HOAs) may prohibit parking of large trailers on driveways or on the streets of some residential areas. Teardrop trailers are the perfect size for easy storage in any garage or driveway. Maneuvering through twisty roads and tight camping spots will also be a breeze with this type of trailer. Apart from the remarkable aesthetics, teardrop trailers are also favored for functionality and versatility. For unrestricted access to many campgrounds and national parks, this type of trailer is the way to go. It is well-equipped for tasking off-road and boondocking trips as well as campground camping. The trailer can be easily attached and detached to free up the towing vehicle for a quick errand run or short trip. Most of these trailers have included awnings, canopies and pop-out features meaning zero set-ups and tear-downs. Therefore, if you feel like hitting the road at any time, just hook it up and go. Teardrop trailers are also the best alternative to tent camping due to the extra features and comforts included. The setting up process in a teardrop trailer is quick and easy unlike in tent campers. Simply pop out the outdoor kitchenette at the back of your teardrop trailer, setup the canopy and you are set! A great deal of add-on options such as tents, shade/bug rooms, visors and awnings can be added to the trailer for maximum living space. The sleeping cabin can also be used as a storage. A tent is a great addon to teardrop trailers. Photo courtesy: Aero Teardrops. A meal by the campfire and tons of explorations and adventures into the great outdoors are the key things that defined true camping in the early days. Teardrops are small in size and will lack the many distractions present in fifth wheelers, travel trailers and motorhomes. They will offer the closest true camping experience possible. 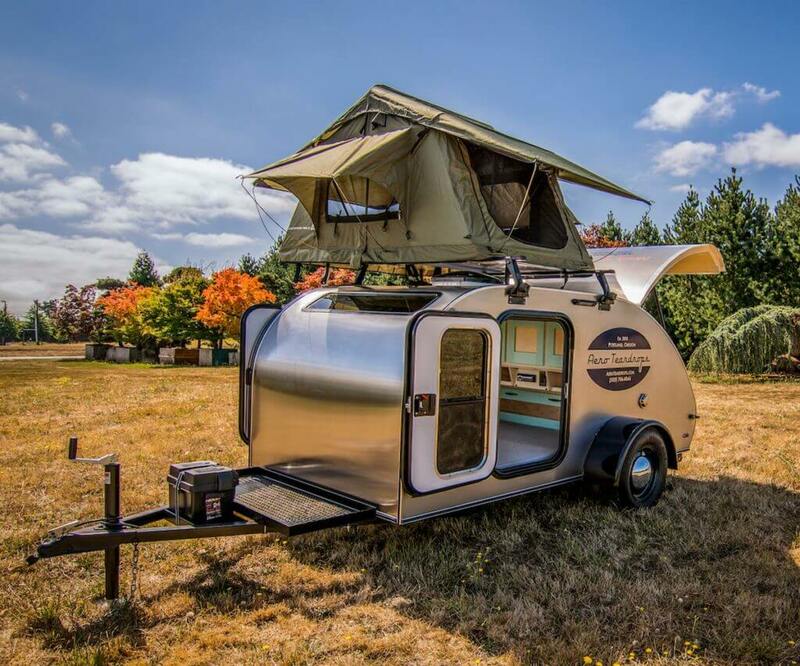 Teardrop trailers are the smallest of all towable RVs. They will save you a lot of money on fuel, maintenance, tolls and campground/national park fees. The light weight, aerodynamics and low-profile design of these trailers also ensure the best possible mileage per gallon. You will be spoilt for choice by the many options of both used and new teardrop trailers out there in the market. The history of teardrop trailers goes all the way back to the Great Depression era, when people would build these trailers with an aim at cost effectiveness and functionality. This principle still holds up to date as anyone with basic carpentry abilities can make their own custom teardrop trailer. Homebuilt models can set you back as little as $500 to $800 on a very basic trailer and about $2500 to $3000 on an upgraded 4 by 8 version. There are many manuals available online to help you out in building your own trailer. The cost accounts for waterproofing, power supply, flooring, camper fan, trailer doors and body as well as kitchen galley. There’s also a vibrant and supportive community of teardrop trailer and camping enthusiasts out there. These enthusiasts freely share hacks, build plans, ideas and other resourceful information in meet ups, online forums and social media groups so you can get the most out of your trailer. 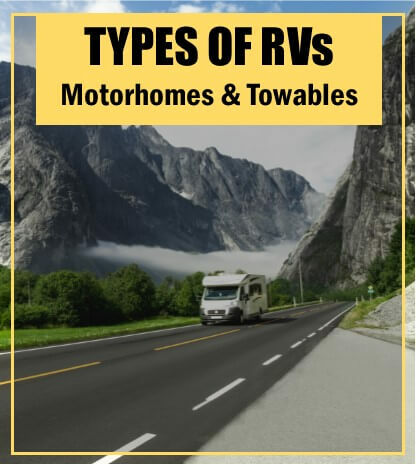 Generally, teardrop trailers come in affordable prices and will feature a good-looking exterior and a minimalist living space filled with all the necessary amenities and features for on-the-road living. You can even have your trailer custom-built to your specifications and budget by the many manufacturers we have today. Arguably, teardrop trailers have the most appealing body design when compared to the bland and boxy designs in motorhomes and other trailers. Plus, they allow for further customization down the line to suit one’s lifestyle and needs. Teardrop trailers are also the kings of minimalist lifestyle unlike other RV types where you have to deal with issues such as refilling the holding tanks, winterizing the rig, noisy generators and so much more. As long as it is for a short period, you can easily make do with the included outdoor kitchen and sleeping cabin. Teardrop trailers are small in size translating to limited storage and living space. They have no bathrooms, toilets or indoor kitchens. You will have to bring along a portable shower, a camping porta potty or fully rely on the campground facilities for washroom needs. The outdoor kitchen will also take some time getting used to and may be rendered useless with inclement weather conditions. Sleeping in the trailer is also limited to one to two adults; else you will have to get a tent for additional sleeping space. Standing upright in most of these trailers is not possible and dressing up will also be a challenge. Storage space is limited thus you have to pack light or store most of your things in the sleeping area when it is not in use. Multi-purpose camping gear and aftermarket modifications like roof racks and kayak racks help maximize the space usage. You can also use your towing vehicle to store some of your gear. As you may be aware already, the small size also poses theft risks as the trailer can be hitched and towed away by any type of vehicle. Bluntly put, a teardrop trailer is just a sheltered sleeping bag on wheels with extras like a kitchen and storage area. If you are looking for a large living and storage space with more amenities and features, this might not be the right RV choice for you. Tents and attachable awnings can help expand the livable space of the trailer but at an extra cost. Teardrop trailers are some of the few RV designs that have stood the test of time; they represent a rich history of just how functionality, simplicity and affordability can go a long way in improving one’s camping experience. They are perfect for camping enthusiasts who don’t mind the small space and can be a perfect upgrade from tent trailers. Teardrop trailers offer a cheap and flexible way to get into the RVing lifestyle, especially for lone-wolves and couples looking for a “real” camping experience.